The Whole Kit & Caboodle! • Every Paid Resource From Mister Harms! To better understand the basic information within the U.S. Constitution, students will browse through this primary source document and find the main ideas regarding the 7 Articles and 27 Amendments. 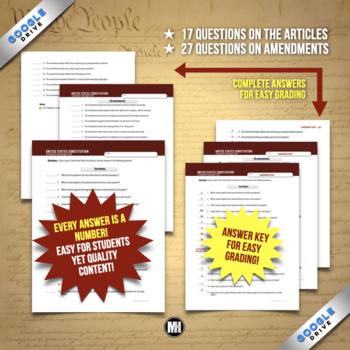 Included are 17 questions about the articles and 27 questions about the amendments. All questions (except for one) will be answered with a number. This is a great way to introduce, study, or review the United States Constitution for your civics unit or for a Constitution Day activity. You may even want to group your students and make this into an engaging, competitive race. Whatever method you use, your students will certainly gain a better understanding of the facts and layout of the U.S. Constitution. It's on-point, simple, and the most effective way to understand what is in this important United States document! Want a Google Drive version of this product? Click here. Which article explains the Judicial Branch and our court systems? According to Article II, how old must you be to become President? Which amendment gives women the right to vote? Save 25% on this product and other civics resources by purchasing the bundle! Save 20% on this product and others by getting the Constitution bundle! A copy of the U.S. Constitution is not included in this product. You will want to use the Constitution found in your textbook or another source. 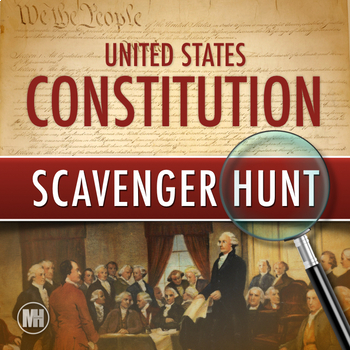 This "Constitution Scavenger Hunt" product can be used for studying just the Articles, Amendments, or the entire document for a full overview. Each year, this method proves to be one of the best ways for my students to comprehend the information and layout of the U.S. Constitution. In addition, I also like to use Constitution: The Articles, Primary Source in my unit on the Constitution. 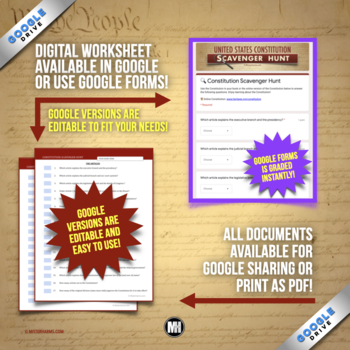 This product goes even more in-depth on the original 7 articles of the Constitution! To introduce the Constitution, you will love this set of Notes on the Constitutional Convention! You might even want to create your very own Class Constitution! I hope you enjoy all of these resources, and thank you so much for your comments and ratings! Thanks so much for stopping by! It's great to meet you! I hope this resource adds value to your classroom. If you have time, I'd love for you to leave a rating on this product with your awesome feedback, and make sure to follow Mister Harms for important updates and savings. I would also love to see how you've incorporated this product into your classroom. Feel free to post a photo of this resource in action and tag @misterharms so I can meet you! I hope you have a wonderful day! Government: The Bundle Get and save big! Stay informed: Join the misterharms.com email list for updates and giveaways!